The Volkswagen Beetle made in the millions and loved by millions more. Spanning some 65+ years this little car has been seen in almost every country on earth. Developed by Austrian engineer Ferdinand Porsche the Beetle became the corner stone of Hitler’s drive to mobilise the German nation. Manufactured originally by the newly formed KdF Stadt factory before the second World War. However the factory only managed to produce 200 cars before war started. World War 2 saw the Beetle mothballed, in fact little trace of the little bug could be found in the factory when Germany fell to the Allies. The car plant had been almost destroyed in the war but the decision was taken to breath life back in to the car plant. During this time the blue prints for the Beetle lay undiscovered and hidden away. It was was only when an unexploded bomb was found and eventually diffused the plans for the ‘love bug’ were unearthed. If the bomb had gone off, the Beetle would never have been made again. Neither the Americans or British wanted the blueprints for their own car plants, stating the design was ‘quite unattractive to the average buyer’. Although not good enough for their own car plants they obviously thought it was good enough for the German buyer. In 1946 the Volkswagen Type 1 as it was known began rolling off the production line painted in Army khaki. The reason for this unusual colour was that although the British car makers disliked the design, the British Army had been persuaded to buy 20,000 cars to give the German car plant an economic boost. Herbie look a like Volkswagen Beetle. 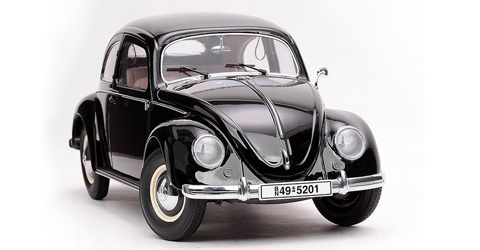 Only 3 years later, in 1949 the Beetle was introduced to the USA. From that moment on the American public fell in love with the car it’s styling, price, efficiency and personality. Younger drivers could afford the ‘VW Bug’ and were drawn to the road. 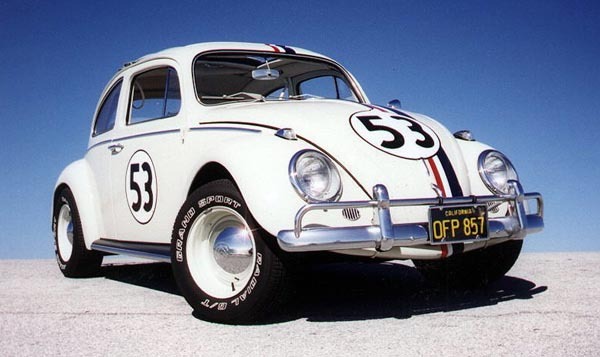 From that point on the car soon became iconic across the world eventually featuring in films such as Herbie. Production of the Beetle in Europe halted in 1974 when Volkswagen introduced the Golf. Popularity of the Beetle and demand for it in other countries meant production was moved to Brazil until 1986 and then Mexico until 2003. The little Beetle with it’s feet in post war Germany and it’s rear mounted air cooled engine. 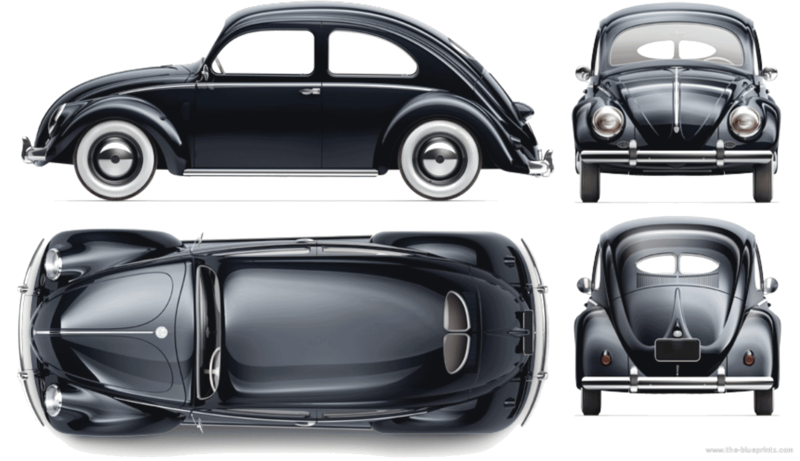 It’s connections with Hitler and styling by a legend in car design Ferdinand Porsche are all of what makes a Beetle. It’s cute and friendly styling saying more about the designer than the terrible times that soon followed. Porsche obviously got it right in so many ways, those big eyes and coupled with affordability will always win the hearts of many. The Ford F Series -but that strictly is a pick up truck. So the Classic VW Beetle isn’t the best selling car, but it’s probably the most loved car in the world. With the introduction of the New Beetle back in 1997 the legacy of ‘The Bug’ lives on. Enchanted as we are with retro chic the new Beetle was soon followed by the new Mini and then the new Fiat 500. Given the new Mini is made by BMW, I wonder if the Isetta Microcar is on the list for a revival? Electric engine, eco friendly … who knows, come on BMW you must still the blueprints? If you’re looking for VW Beetle Merchandise try on Amazon they have literally pages of the stuff. Vespa – the much loved Italian icon Isetta Microcar Executive Chauffeur – Liverpool A&M Tyres Wigan Super Holiday in a supercar!